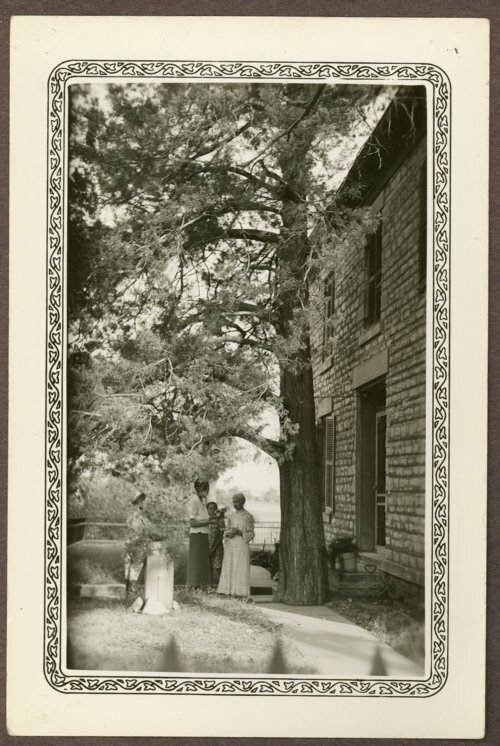 These are two photographs of Mrs. Payne with her daughter and Hattie Parkerson, Isaac Goodnow's adopted niece, at the Isaac Goodnow home in Manhattan, Kansas. Isaac T. Goodnow, a native of Vermont, came to Kansas in 1855 with the New England Emigrant Aid Company. They had the idea of building a community, which would eventually become Manhattan. Goodnow became heavily involved in the free state disputes that argued whether Kansas ought to become a free or slave state. He became a co-founder and the first president of Bluemont College. Perhaps Goodnow's greatest contribution to the educational climate of Manhattan was his work in locating the Kansas Agricultural College there. The building and grounds of Bluemont College were donated to the state to serve as the foundation for the new institution, which has developed into the present-day Kansas State University. Some 82,000 acres of land were given by the federal government to support the agricultural college. Goodnow converted more than half of this acreage into much needed cash during his tenure as land agent for the college from 1867 to 1873. Goodnow spent most of his life in service to the state of Kansas, until his passing in 1894. The house that he and his wife, Ellen, occupied is now Goodnow House State Historic Site, administered by the Kansas Historical Society. These are two photographs of Mrs. Payne with her daughter and Hattie Parkerson, Isaac Goodnow's adopted niece, at the Isaac Goodnow home in Manhattan, Kansas. Isaac T. Goodnow, a native of Vermont, came to Kansas in 1855 with the New England Emigrant Aid Company. They had the idea of building a community, which would eventually become Manhattan. Goodnow became heavily involved in the free state disputes that argued whether Kansas ought to become a free or slave state. He became a co-founder and the first president of Bluemont College. Perhaps Goodnow's greatest contribution to the educational climate of Manhattan was his work in locating the Kansas Agricultural College there. The building and grounds of Bluemont College were donated to the state to serve as the foundation for the new institution, which has developed into the present-day Kansas State University. Some 82,000 acres of land were given by the federal government to support the agricultural college. Goodnow converted more than half of this acreage into much needed cash during his tenure as land agent for the college from 1867 to 1873. Goodnow spent most of his life in service to the state of Kansas, until his passing in 1894.